…an examination of his tax appeals on several properties, and other documents obtained by The New York Times through Freedom of Information requests, shows that what Mr. Trump has reported on those forms is nowhere near a complete picture of his financial state. The records demonstrate that large portions of those numbers represent cash coming into his businesses before covering costs like mortgage payments, payroll and maintenance. After expenses, some of his businesses make a small fraction of what he reported on his disclosure forms, or actually lose money. On the financial disclosure forms that Donald J. Trump has pointed to as proof of his tremendous success, no venture looks more gold-plated than his golf resort in Doral, Fla., where he reported revenues of $50 million in 2014. That figure accounted for the biggest share of what he described as his income for the year. But this summer, a considerably different picture emerged in an austere government hearing room in Miami, where Mr. Trump’s company was challenging the resort’s property tax bill. Mr. Trump’s lawyer handed the magistrate an income and expense statement showing that the gross revenue had indeed been $50 million. But after paying operating costs, the resort had actually lost $2.4 million. Donald Trump is a bigot, a thug, the kind of man whom women know all too well. He’s a braggart, a bully, and the least self-made alleged rich guy short of the Walton kids. And through it all, he’s crap at the stuff of which he claims to be the world champeen. Would you trust the coffee fund, much less the national budget, to this guy? But time and again, what the form presented as income did not match what was reported in other documents. Mr. Trump also runs several publicly owned attractions — the carousel and ice rinks in Central Park and a golf course in the Bronx — under agreements with New York City. Mr. Trump’s disclosure forms reported income from the Wollman and Lasker ice rinks of just under $13 million last year, and $8.6 million the year before. But accounting figures provided by his company to the city show that those figures represent gross receipts…Recent figures were not available, but a 2011 city audit showed that for the previous three years, an average of $25,340 a year for both rinks was left after expenses. With Logan Airport charging roughly eight bucks a gallon for Jet-A fuel right now, that would pay for barely more than a quarter of a tank of gas for The Donald’s aging jet. He’s a bust-out artist, not a businessman. I’d laugh, except for the non-zero (though still small) chance that this lying sack of ferret fæces could be President-elect next week. 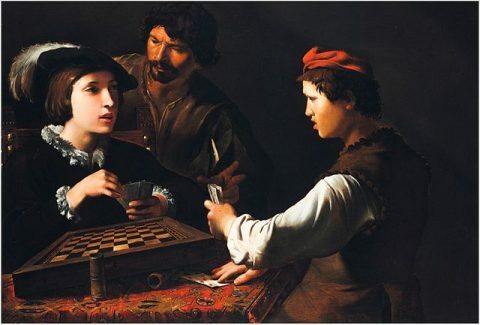 Image: Pietro Paolini, The Card Sharps, 1620s. This entry was posted on November 3, 2016 at 4:54 pm and is filed under Election 2016, Oops, Republican knavery, Uncategorized. You can subscribe via RSS 2.0 feed to this post's comments.